CoRE labs products are designed to withstand the rigors of high volume imaging environments. 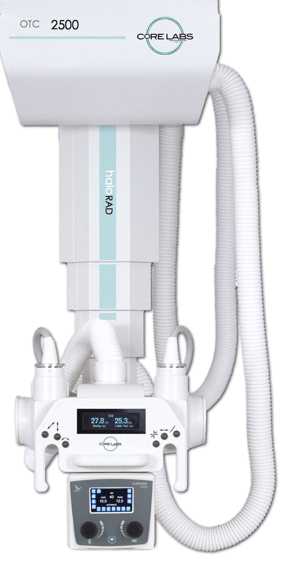 Made in the United States of America, with the finest materials, we are sure you will be proud of your investment in what we consider the best radiographic equipment available. CoRE labs has never issued an End-Of-Life notice. Even their very first systems installed are still fully supported and working hard for their owners. Our systems are found in leading hospitals, clinics & orthopedic offices throughout North America, South America & the Caribbean. We are confident you won’t be disappointed in your choice.CoRE labs suites were designed to work seamlessly for the fastest throughput clinical environments. With continuous SID display, rapid one hand positioning and optional SID automatic tracking, your radiographic department can be assured to care for a fast paced workload. To speed installation, all suites come with onboard 24v power and wiring interfaces for ancillary equipment. Our award winning user interface provides an easy to read, large backlit LCD display which shows SID and tube angulation. With continuous SID display, one can achieve 40” SID with any table height allowing tall and short technicians alike to work in a height environment which is comfortable to them. Operator fatigue is minimized through European & American engineered designs, providing less than 5 pounds necessary force, for movement in all directions.